Note: There is a time change for weekday rides, now 8:30 am. The feature story is worth sharing with friends interested in riding with a Bike Club. Reminder! SBC has a sponsorship table to promote your club during Amgen Stockton Stage Five Start Activities. Stop by the SBC Table and support your club. 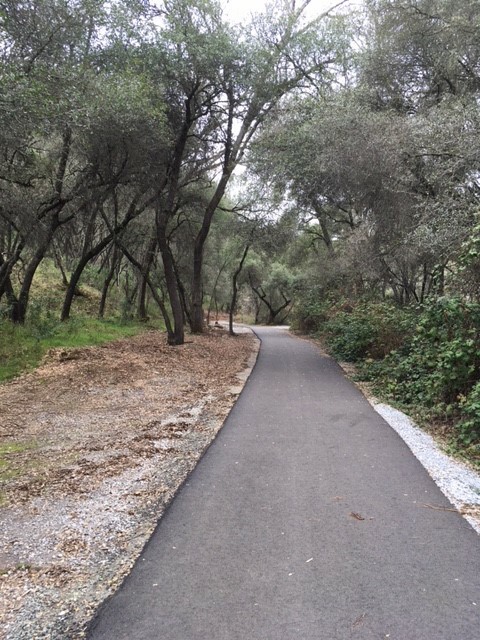 Can you imagine a Bike and Walking Trail linking Jackson and Sonora, or San Andreas and Angels Camp? If so, let’s take steps to plan, build and maintain a Bike and Walking Trail in the Motherlode. I have an idea to raise seed money to begin planning. The purpose of the fundraiser is to raise awareness and generate funds to hire a land use planner. The fundraising event is a two day Grand Fondo Bike Event for 200 cyclists riding from Jackson to Sonora. The route would not follow highway 49, but ride along the back roads of Amador, Calaveras, and Tuolumne Counties in June 2020. If you are interested in supporting this long term project, email rbwilliams72@gmail.com or call 209-531-5844. Advisory bicycle lanes (ABLs) are a roadway striping configuration which provides for two-way motor vehicle and bicycle traffic using a central travel lane for motor vehicles and “advisory” bike lanes on either side. The center lane is dedicated to, and shared by, motorists traveling in both directions. Cyclists are given preference in the bike lanes but motorists can move into the bike lanes in order to pass other road users after yielding to other users there. These shared bike and vehicle roads exist in Netherlands. 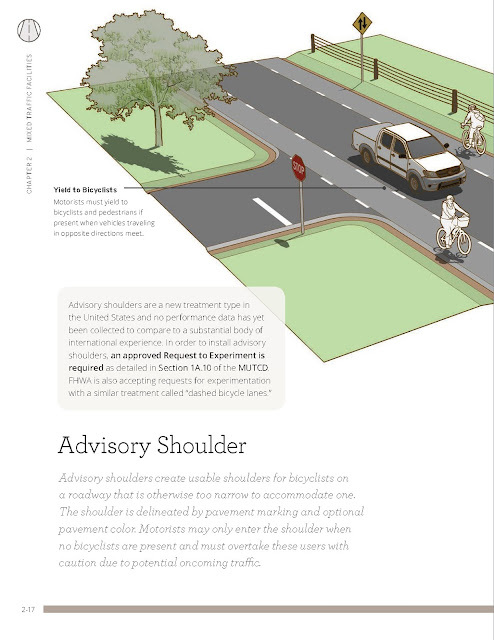 Calaveritas and Salt Springs Roads could be designed as Advisory Bike Lane Roads. The county and Tourism Office could promote these cycling roads as cycling friendly that would benefit our local economy. The CBAC members have placed on the next agenda further discussion to present a request for Cal Trans Study and experimentation. Join Cal Bike for the 5th Annual California Dream Ride, October 7-12, riding from Santa Barbara to San Diego. The route features stunning natural vistas and is moderately challenging, with some uphills to test your mettle. Participants can also try our new complimentary E-bikes. 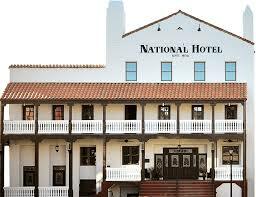 Upscale hotels, delicious meals, and attentive staff are included. Just pedal and have fun! A Bike Advocacy Group, at https://www.cyclistvideoevidence.com is calling for an Enforcing Laws for Cycling Safety Town Hall to respectfully discuss law enforcement's and our court system's commitment to cycling safety, lessons they have learned over the years working in Alameda County, and best practices that can be shared and institutionalized. They are waiting to hear if the Alameda County District Attorney accepts an invitation to hold a Town Hall Meeting. They also invited the CHP, the Sheriff, and all cycling safety stakeholders. A group of cyclists from the Stockton and Stanislaus Bike Clubs and former Cal Trans District 10 Chief Planner met with the San Andreas CHP to discuss cycling in the Motherlode and Sierras. The meeting was very productive! We discussed popular cycling roads and events in Calaveras County, cyclists and vehicle safe practices, and using the San Andreas CHP Facebook page to promote safe cycling in the Motherlode. A second follow up meeting is planned for December 2018. Recently, I went for a bike ride with a bike pal from the past, Dr. Kelley George, Sonora Pediatrician. It’s been 18 years since we cycled together and we rode a 35 mile loop from Knights Ferry to Woodard Reservoir. The weather was perfect and the roads were clearly marked to Share the Road with cyclists. For most of the two hours we shared stories about family, work, cycling, and some politics. Kelley shared this heart warming story about kitten, Charlie. Four years ago Kelley and his bike friend, Marvin, a veterinarian were riding the same route I was enjoying. It happened that Kelley and Marvin were riding in a crisp fall afternoon near Woodard Reservoir and stopped to enjoy scenery. Charlie appeared out of the tall brown grass, malnourished, weighing 2 pounds and very thin. Kelley shared his peanut butter snack bar and water. The baby kitten, never left his side! In fact, Kelley and Marvin took turns riding 17 miles back to Knights Ferry with Charlie tucked in their front jerseys. 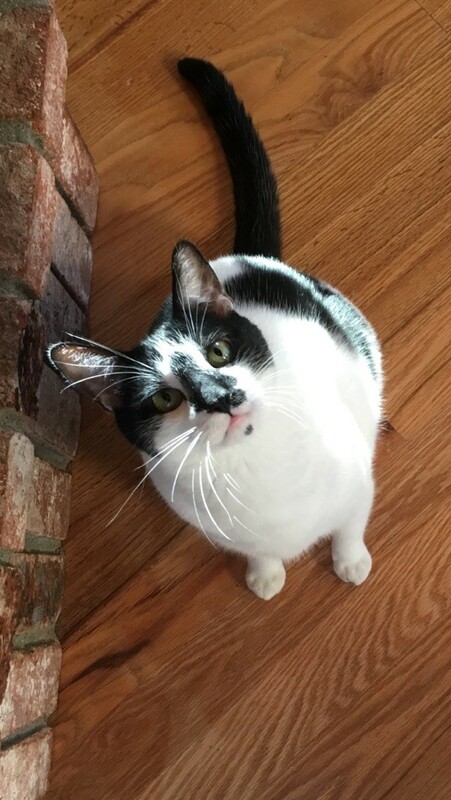 Marvin took Charlie back to his office and cared for baby kitten until ready for returning to the home of his founder and champion, Dr. George. 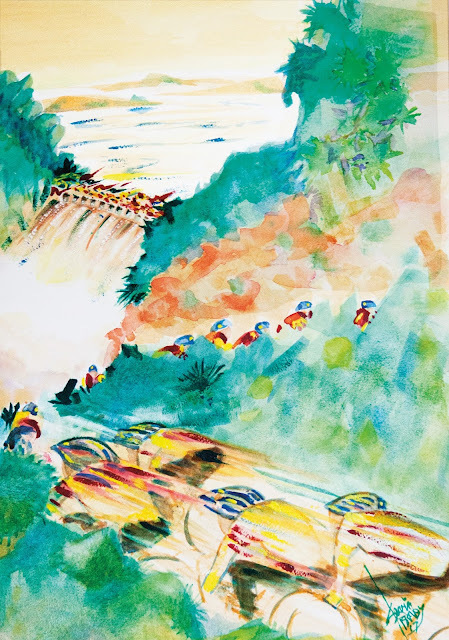 Calaveras County Arts Council is proud to present Ride & Walk4 Art, a bicycle ride and walk to raise funds for the Arts in Education program. This year, the annual fundraiser has a new venue: West Calaveras County. 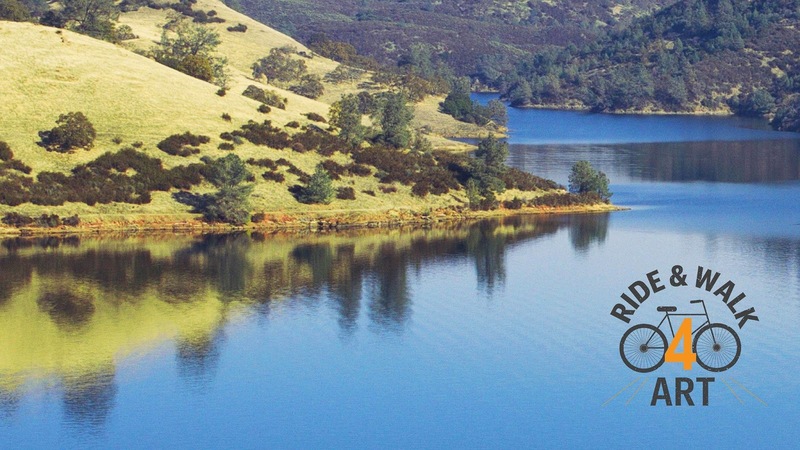 Cyclists from all over Northern California will pedal through Valley Springs past Camanche, New Hogan, and Pardee lakes while walkers hike Hogan Dam Trail. The $30/bicyclist and $20/walker entry fee includes a Chicken-in-a-Barrel lunch prepared by the Tri-Dam lions and there will be an on-site show featuring local artists. For more information, visit Calaverasarts.org or 209/754-1774. Have fun for the arts! 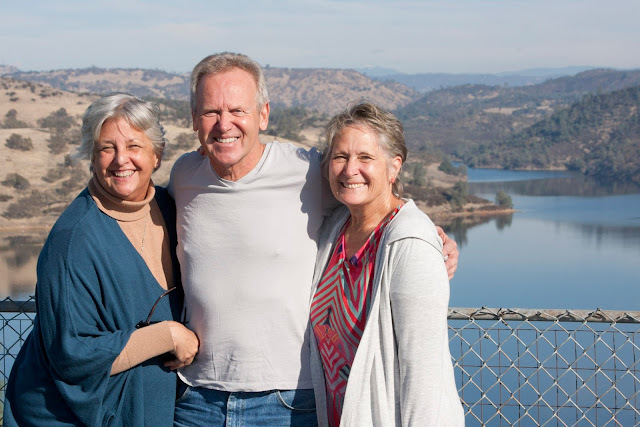 Rob Williams (photo below, center) is unabashedly a champion of bicycling, the arts, and West Calaveras County. That’s why this year, as chairman and chief organizer of Calaveras County Arts Council’s Ride & Walk4Art, he decided to move the event, scheduled for Sunday, March 18, from San Andreas to West Calaveras County. Organizers from left: Kathy Mazzaferro, executive director; Rob Williams, event chairperson and organizer; Dereen Deschryver, art show chairperson. ​Registration closes at 250 riders and 40 walkers. Please join us on Sunday, March 18, 2018 for Ride & Walk4Art in the beautiful California foothills in West Calaveras County. Choose from 2 bicycle rides—25-miles or 45-miles—or an easy 4.5-mile walk skirting New Hogan Lake. We're accepting no more than 290 participants—250 cyclists and 40 walkers—making this an intimate ride with a community vibe. You'll traverse rolling California foothills along roads that rarely see cars, past scenic views of oak forests and pastoral meadows and the blue waters of three reservoirs. Your participation will help raise funds for the Calaveras Arts Council Arts in Education program, a program designed to bring art, music, dance, and theatre to the schools of Calaveras County. In the last two years we have supported watercolor classes, collage instruction, ceramic classes, and school murals. The kids are creative; they are hungry for art. In 2018 the CCAC plans to offer even more art. Simply by having fun, you can help us help the children of Calaveras County. 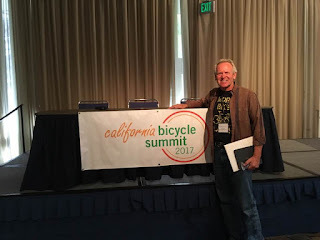 During October 3-6, I was a presenter at the CALIFORNIA BICYCLE SUMMIT and attended the Cal Trans California Bike Advisory Committee meeting. My grandson Rhett was born on Sunday, October 8. Rhett spent his first three weeks at Stanford, not as a student but as a patient at Children's Hospital and returned to his home in Sonora on Wednesday, November 1. He is a handsome, healthy baby, with a full head of white hair and his parents displayed true grit and love during the last three and half weeks. During my time in Palo Alto I learned the value of professional care and teaching hospitals. I also realized how important establishing a culture where parents, medical staff, patients, and visitors wash their hands, not once but several times during the day. This norm was embraced, expected and monitored. And, this level of care insured that babies don’t get sick during their hospital stays. Of course, I looked at this culture of care and thought of cycling in the Foothills. Imagine if vehicle drivers embraced that cyclists shared their roads, expected a cyclists riding along a shoulder, and all vehicles gave cyclists three feet of safety. 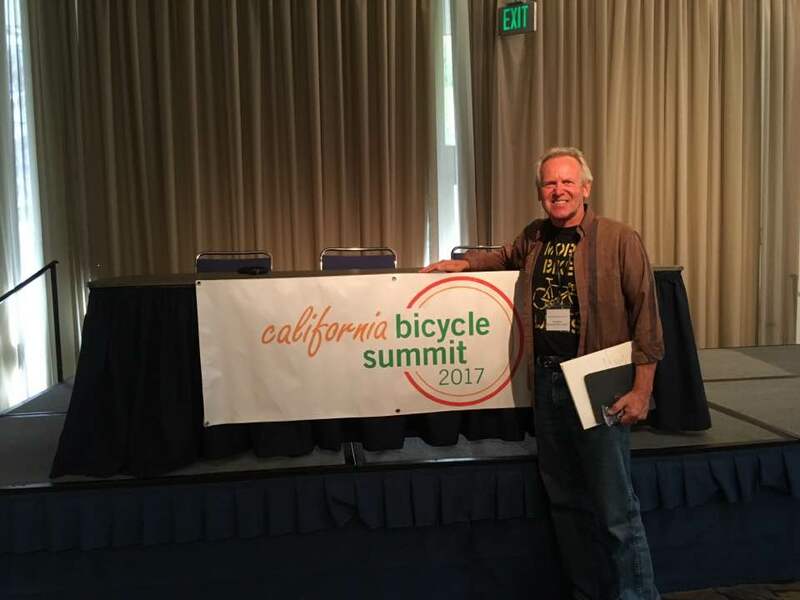 I attended several sessions at the California Bicycle Summit. My favorite two sessions: Ten Years and $52 Billion-Making the Most of Senate Bill 1, the largest transportation funding increase in the states history, and the CalTrans Bicycle and Pedestrian Plan. Senate Bill 1, is the tax measure that will bring in $5.2 billion in annual funding to help the state achieve its climate and air quality goals. I learned that the new gas tax money that will be used for bicycle and pedestrian improvements needs local communities to develop and plan updated bike and pedestrian plans. And, I listened carefully when Phoebe Season, Leadership Council for Justice and Accountability spoke about rural communities having an equal share of SB 1 Active Transportation funds. At the Caltrans Meeting, during Q and A I asked about the latest Rumble Strip moratorium. And, I was asked to email Cal Trans for a response. FYI...The California Bicycle Advisory Committee is still addressing this issue with Cal Trans Director, Malcolm Dougherty. Also, I learned how important the role of the CalBike advocacy is to insure that SB 1 funds support the mission of the California Bicycle Coalition. Cal Bike drafted ten principals to guide policy makers on using SB 1 transportation monies. I also learned how important our Local Active Transportation Group is to securing County, State and Federal grants. This group is critical in supporting Bike friendly planning. In 2017, the Calaveras Active Transportation Group and the Calaveras Council Council of Governments submitted an Active Transportation Grant to support Cycling Tourism in the Motherlode. The grant was not funded in 2017, but has been rewritten and resubmitted for funding in 2018. This grant if funded will help identify roads that are used by cyclists and means to promote cycling tourism in the Motherlode Counties: Calaveras, Alpine, Tuolumne and Mariposa. Coming soon will be another opportunity for our rural counties to access SB 1 monies and the State will be hosting grant writing workshops. I’m planning to attend grant writing workshops to seek monies for the Cal Trans District 10 Motherlode Counties. 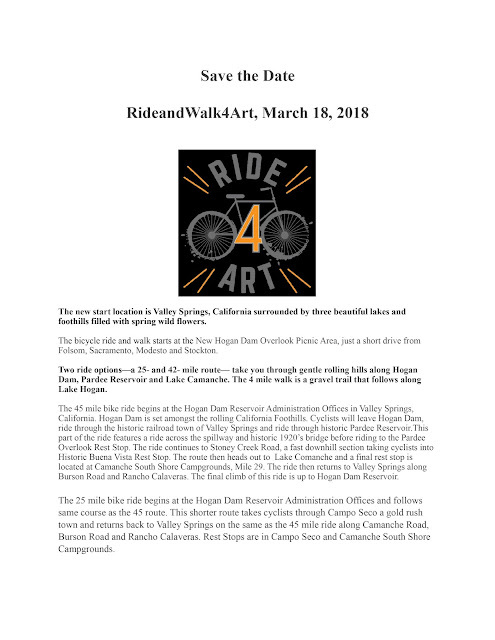 RideandWalk4Art will be held on Sunday, March 18, 2018. The new start location is New Hogan Dam Administration Office. The ride options include a 30 and 60 Mile Ride out to Pardee Reservoir and Lake Comanche. 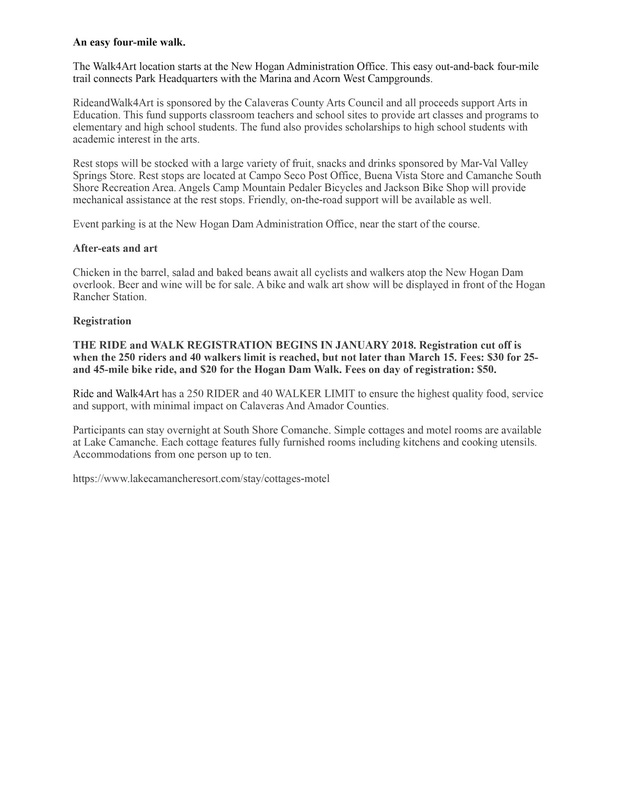 A three mile Walk will be along the Hogan bike and walking trail. And, we will be holding a mountain bike ride out Acorn Campgrounds. A bike and walk art show will be on display along with our popular chicken in a barrel lunch. A “Doing Business As” statement on behalf of the Motherlode Bicycle Coalition was filed in Valley Springs News for 30days and its official! MBC is an affiliate of of the California Bicycle Coalition under this organizations Education Fund. The Bike Safety Riding Meeting with the local Calaveras County Highway Patrol, Sergeant Tobias Butzler has been rescheduled in December. The purpose of this meeting is to introduce ourselves, discuss popular ride locations, safety concerns, and cycling events in Motherlode. The Jackson Historic Bike Race and Ione Family Ride were both a success for cyclists! Over 100 Northern California Nevada Bike racers raced around downtown Jackson and loved the course. We had 20 cyclists enjoy the Sunday ride out Five Mile and Brubeck Roads. For 2018...we are reviewing potential Criterium and road race locations to hold a weekend of Bike Racing in the Motherlode! Ride & Walk 4 Art: It's a party! Get your tickets now for A Night at the USO! The CCAC proudly presents a night of dinner, dancing and fun. And a chance to bid on a Pedego Electric Bike rental at our March event, Ride & Walk 4 Art (click here for more information). Click here to "Enlist" and buy tickest for A Night at the USO! And don't forget our art exhibition! Artist Reception on October 1, 3 p.m. to 5 p.m.
Those words mean the world to those who serve our country. 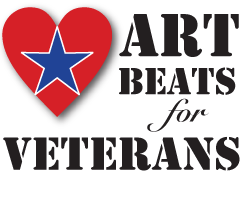 This show is part of the ️Art Beats for Veterans project, and seeks to honor the men and women of Calaveras County who have heeded those words for a hundred years. 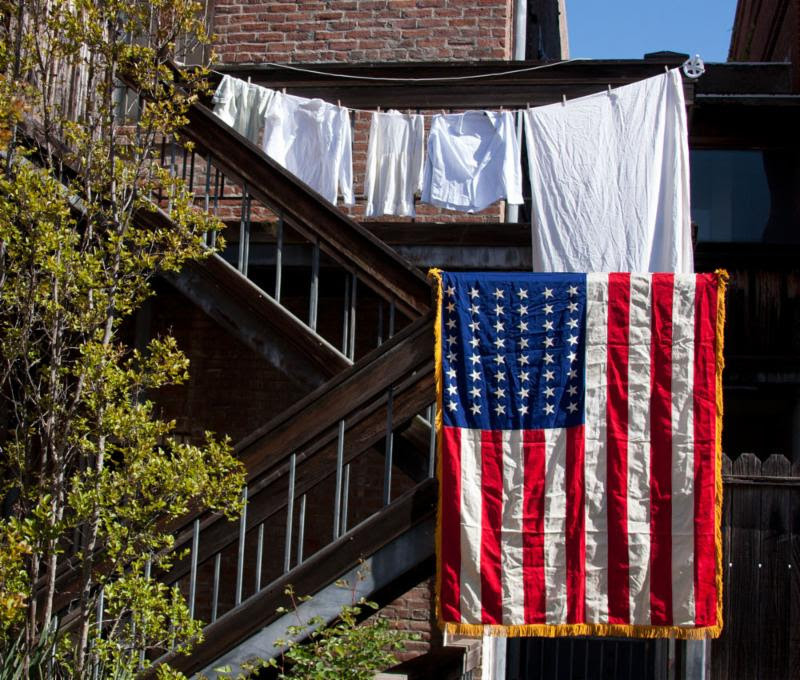 Over the last year, we've been staging vignettes of Veterans homecomings on the staircase in the back of our gallery. Artists have come to photograph, paint, draw, or simply absorb scenes of live models portraying mothers, fathers, children, and sweethearts welcoming home their veterans. Artists all over the county have been been busy creating artwork on these themes. Now this work will be coming to the gallery; we're excited by the response we have gotten so far. This week hanging crew will be arranging the show, and on Sundaywe'll have the opening reception. Art does not have to be of the Vignette scenes; anything at honors our Veterans will be lovingly accepted. We hope to see you Saturday and Sunday. It's a big weekend! Oct 1 Artist Reception, 3 p.m. 5 p.m.
All artists are welcome, and especially Veterans. 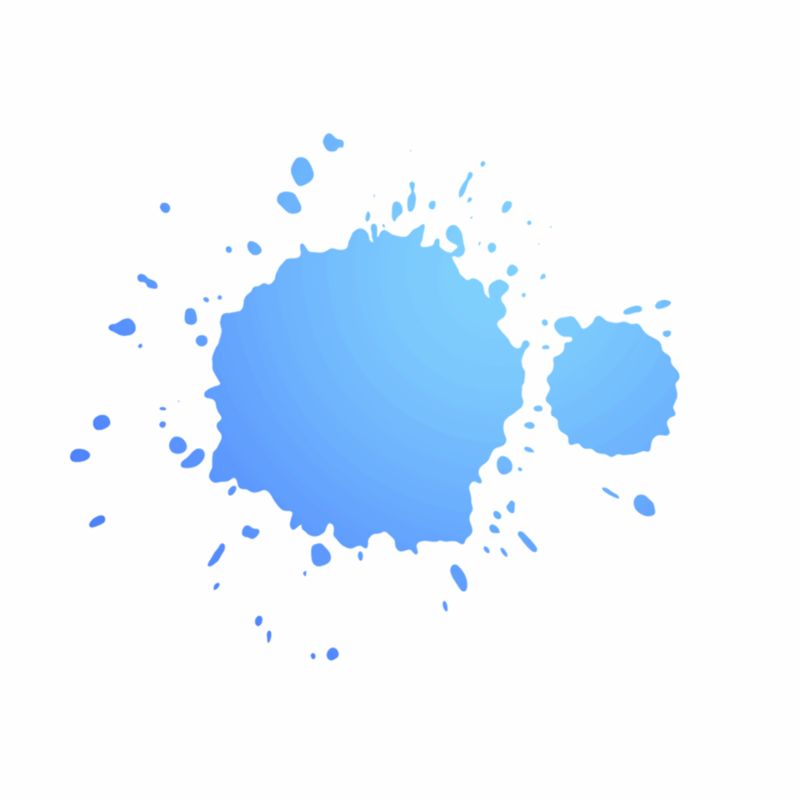 We hope to see your art. We thank our Sponsors for their generous support! Calaveras County Arts Council's mission is to support, nourish, and awaken the arts in our community. We rely on people like you, who believe that the arts make this world a better place. Give us a shout to find out how you can help. We need volunteers, helpers, members, and artists!